BTC/USD bulls stop short of $5,200. The price is sandwiched between strong support and resistance areas. Bitcoin (BTC) is hovering under $5,200, mostly unchanged since the beginning of the day. The cryptocurrency market has been rangebound with a bullish bias, recovering from the recent downside correction. However, the upside momentum is not strong enough to take the prices out of the ranges. 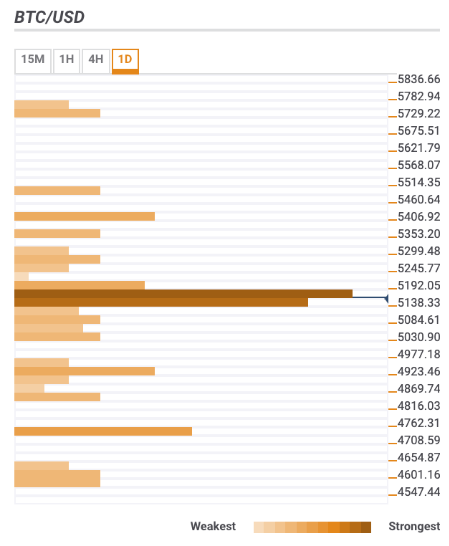 The strongest technical levels are clustered around the current price, which means that the market will have a hard time taking BTC out of the recent range. However, a sustainable break in either direction is likely to create a strong impulse. A cluster of SMA levels above the current price includes DMA50 4-hour, SMA200 1-hour, DMA10. They are combined with 61.8% Fibo retracement daily and an upper boundary of 4-hour Bollinger Band. The critical barrier $5,400 is strengthened by a Pivot Point 1-week Resistance 1 and Pivot Point 1-day Resistance 3. Below the current price, the first support area is created by 38.2% Fibo retracement daily and 61.8% Fibo retracement weekly plus midline of 1-hour Bollinger Band.